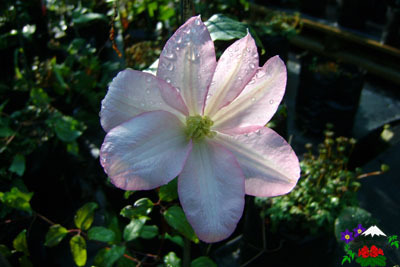 We have many varieties of Clematis, so have listed them alphabetically. If you wish to view the full list, which may take a little time to load, then please select 'All listings'. There are also defined groups, if you have a particular variety in mind. 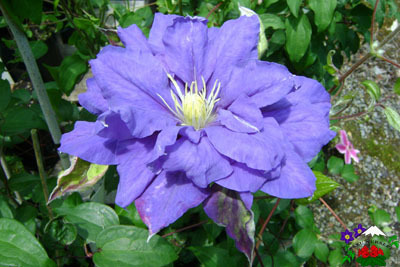 Please click on a link below, to see the Clematis descriptions. Blush white with pale pink bar 12-15cm. Tepals x6-8. Prominent cushion of bright purple anthers. Sweet violet scented. Attractive seed heads. 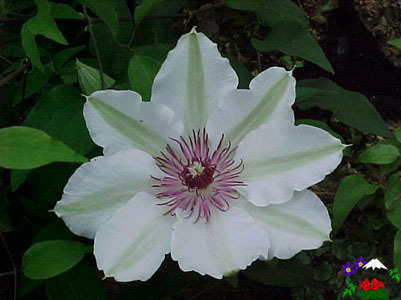 (xB) The only recognised scented large-flowering cv. 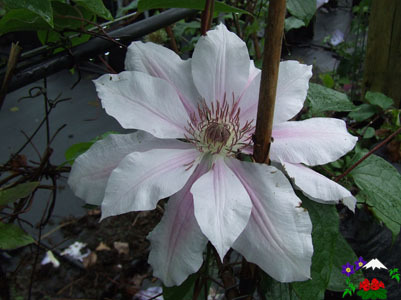 Flowers very large 23-25 cm across, tepals light pink with a rosy pink bar, anthers light brown. Suitable cut flower. (xB) Early to late summer. Away with the Fairy's, quite nice! If you grow or know anyone growing this variety in NZ, please let us know. Strongly hawthorne-scented, star-shaped flowers, 25-35mm across. Leaves trifoliate coriaceous (leathery) white evergreen. October-November (xA) Smaller than Cl. armandii and later flowering. Very large white flowers with faint green lines along the bar. Filaments white, reddish near top, the black-purple anthers gives a dramatic contrast. Flowers blue-mauve with deep petunia-red bars, 18-20cm. Tepals x6-8 and dark beetroot-red anthers. Late summer-early autumn. (xB) Cut flower! Very vigorous, flowers in masses, small white 3cm hawthorn-like scented (personally I think it is elderberry blossom). This form has narrow bi-pinnate leathery leaves which make it look evergreen, but it's deciduous! Will easily reach 4m in a season. Hard pruning! (xC) Very nice when planted together w. Cl. viticella. Flowering time here December to February. This type is seen growing in sand dunes in Spain. . . . . . . This species has been blacklisted. In my 20 years of growing this species in NZ, I have only found two surviving related seedlings. Still we recommend autumn pruning to avoid seed-ripening! Cl. flammula needs good drainage and are relatively short-lived; 10 years or so. This species is under threat in Europe. Purple flowers with a darker redder bar. 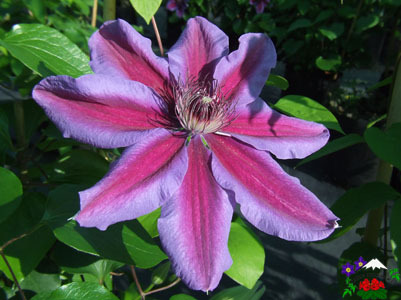 ®Boulevard collection of compact patio clematis. Is a semi-evergreen species which sometimes is flowering throughout the winter with us, as well as flowering spring and autumn, and often seems to be dormant or semi-dormant during midsummer (often believed dead). This makes them a bit fickle and we find them one of the more difficult plants to survive (we are still learning) Therefore we will only sell this species as a two year plant (premium size). We do NOT replace this species if lost! This is the rare double seed setting viticella, making it possible to breed new double viticellas from it. Strong grower with flowers 8cm across, packed w. tepals, but still with a centre of anthers and stigmas. The colour is soft "old rose" purple, very close to the colour of mother PPE. We do have 3 diff. under this name. Doesn't like the warmer parts of the country. 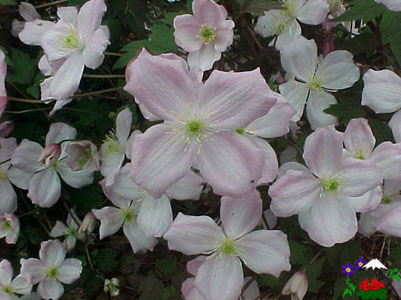 Medium to large, fully double, mauve flowers with whitish stamens and yellow anthers in both early and late flowerings. ®'Regal' collection, named after Raymon Evison's youngest daughter. 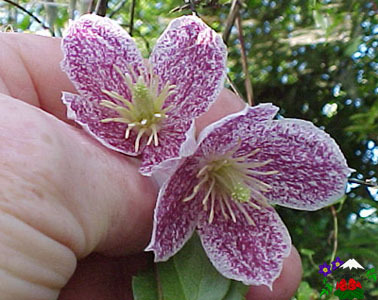 Flowers 5cm bell-shaped cream-pink with red blotches (freckles) wintergreen foliage, winter-flowering, also summer. Scented. AGM (xA) Grow over arch so flower can be seen from below.